Honey in history. Prehistory, Ancient Egypt, Ancient China. Talking about bees and honey in history must always include Ancient Egypt and Ancient China. But starting from the very beginning of times, we must say that bees are actually one of the oldest forms of animal life, since Neolithic Age, preceding humans on Earth by 10 to 20 million years. When they appeared, humans did whatever the other animals were doing at the time, meaning, stole the bees’ honey to feed themselves. Homo Sapiens and honey were together since the Stone Age. 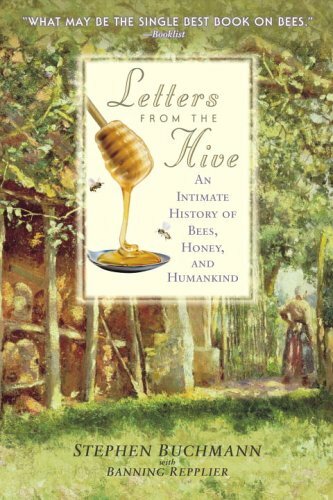 In the beginnings all bees were wild, humans discovered how to keep them in hives much later. People were gathering and eating honey because it was the only sweetener available. They needed to climb up to the bees’ nest, often risking their lives. 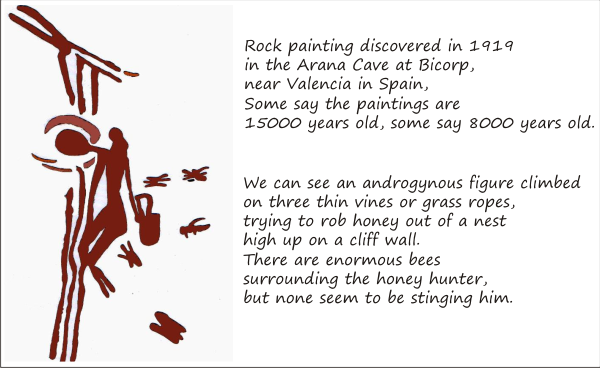 Some of the oldest fossil bees were found in the amber of the Baltic Coast. 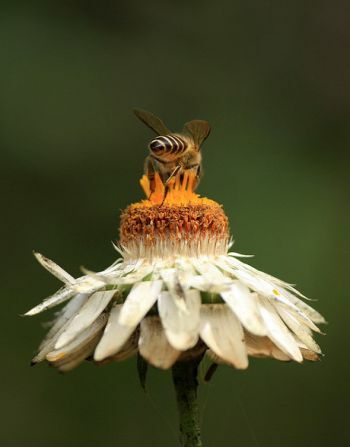 Scientists considered them the ancestors of today’s honey bee. 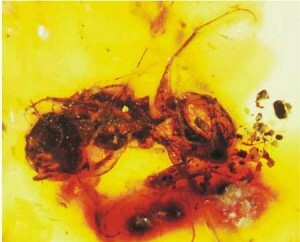 In 2006, the oldest bee fossil was discovered in the Hukawng Valley of Myanmar (Burma), preserved in amber, in a mine. It is considered to be 100 million-year-old! Amber is a tree sap that often traps insects and plant structures before they fossilize. The fossil measures a quarter-inch and has traits of the carnivorous wasp, like narrow hind legs while exhibiting branched hairs on its leg, a characteristic of the modern bee that allows pollen collection. The complete study is in Oct. 27, 2006 issue of the journal Science. 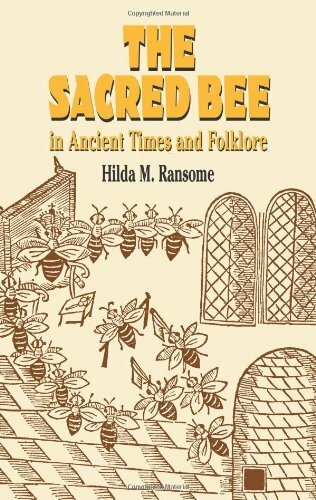 Bees and honey are mentioned early in our human writings, ever since Sumerian and Babylonian writings and there are laws about bees in Hittite Code. In Ancient Egypt the bee was used as a symbol, a hieroglyph, denoting the king of Lower Egypt mentioned first in the Kahun papyrus. 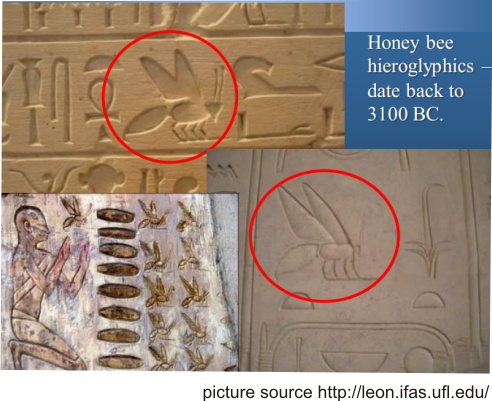 Honey was discovered on many wall paintings, belonging to Old Egypt. According to Ebers Papyrus, 1550 BC it is included in 147 prescriptions in external applications. “Mix honey, red ochre, powdered alabaster to cure spotted baldness” or include honey after surgery, as suppository and to reduce inflammation. Similar mixtures were used to: dress wounds, burns, abscesses, sores and skin conditions resulting from scurvy. Other uses included: application after surgery including circumcision, as a suppository and to reduce inflammation and loosen stiff joints. The Egyptians have kept bees in hives, similar to those still used in that part of the world today, for over 4000 years and honey was, and is, much used in medicine. In the Bible Egypt is described as a land “flowing with milk and honey”. 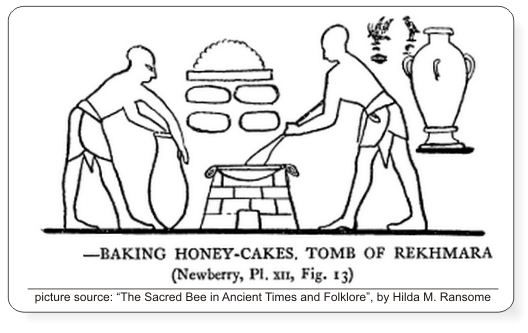 At that time Egyptians must have known a lot about bees and beekeeping. Honey was used in every house, on every class as a sweetener and medicine. There is a marriage contract in existence which says: “I take thee to wife…and promise to deliver to thee yearly twelve jars of honey”. The magicians and physicians, as they were almost identical by that time, knew about the healing properties of honey, and there are lots of recipes in the medical Papyri to prove this. Many of those recipe were handed down from generation to generation, and Greeks took them from here as well. Honey was considered an important medicinal remedy as shown in their writings dating from about 2000 BC. 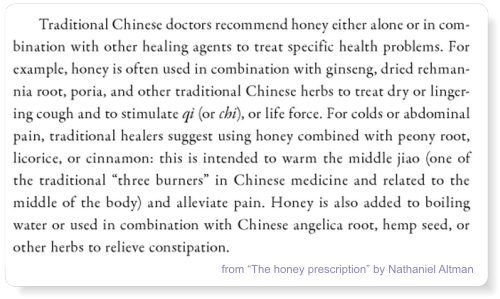 On www.naturalnews.com Christopher Gussa writes: “Honey is known as Feng Mi and has the ability to nourish yin energy and strengthen the spleen. Apart from its widely recognized nutritional value, honey is also the Chinese people’s favorite as a “neutral” food with medicinal properties. In the “Compendium of Materia Medica,” a classic book of traditional Chinese medicine, by pharmacist Li Shizhen, in the Ming Dynasty (1368-1644), we can find: “Honey can help dispel pathogenic heat, clear away toxins, relieve pain and combat dehydration.” Li Shizhen showed that eating honey regularly resulted in clear sight and rosy cheeks. He also wrote that eating honey every morning can help prevent constipation and it is a good choice for those who suffer chronic coughing. Traditional Chinese medicine teaches us that due to honey’s affinity for the stomach and spleen it can greatly enhance the effect of many of the super-tonics, such as He Shou Wu (Chinese medicine)”. Honey and warm milk has been a traditional old remedy for treating gastritis and stomach ulcers and eating honey was always recommended to treat anxiety and insomnia. in 2007, The Malaysian Journal of Medical Sciences was publishing Siu Wan’s article: “Honey in Chinese Medicine”. It says: “Honey has been used in traditional Chinese Medicine to treat many diseases for more than two thousands years. In Traditional Chinese Medication, honey is a combination used with bee venom, propolis, royal jelly, pollen and other herbal medications in medical treatment. In addition, the following diseases are good indications for using honey. B. Infections caused by gram-negative bacteria, e.g. Meningococcal infections- Meningococcal meningitis., Salmonellae infections-Typhoid fever, Salmonella Gastro-enteritis., Shigella infections-Shigella dysentery. A. Gastritis, B. Peptic ulcer Disease, C. Celiac Disease, D. Antibiotic-Associated Colitis. E. Inflammatory Bowel Diseases. III) Allergic and Immunologic Disorders: A. Allergic Rhinitis B. Rheumatoid arthritis, C.
Systemic Lupus Erythematous(SLE), D. Ankylosing spondylitis, E. Multiple Sclerosis.